The Norstead Viking Village at L'Anse aux Meadows only 2 kms from The UNESCO World Heritage Viking Site has been identified as one Canada's top ten 'Hidden Travel Gems'. It's part of the Canadian Tourism Commission's 'Locals Know' campaign. The Norstead site comes in at number 9 on the list that is determined by Canadians themselves from coast to coast. Other top ten picks include Georgian Bay in Ontario, the annual Caribana festival in Toronto and Long Beach, Vancouver Island. Norstead: A Viking Village and Port of Trade on L'Anse aux Meadows, Newfoundland is a non-profit organization that was created to take history out of the exhibit case and place it in the hands of visitors. Join costumed interpreters in the dim light of the Viking-style Chieftain's Hall and listen to mysterious Viking tales.Check out info on the blacksmith forging iron. Step aboard the full-scale replica of the Viking ship "Snorri". Learn how the Vikings mastered the North Atlantic. Use a simple notched stick to measure distance by the stars. Get you "Runes" told by the wise women. Shape clay into pottery the way the Vikings did. Spin sheep fleece into yarn using ancient drop spindle technology, dye the yarn bright purple, pink, or rusty yellow using local plants and berries....weave it into cloth at the loom. It’s in your hands to explore! Located about two km from L'Anse aux Meadows UNESCO World Heritage Viking Site, the only authenticated Viking site in North America, Norstead replicates a Viking port of trade as it may have looked during the Viking era (790-1066 AD). The four-hectare site has a boat shed with its very own Viking ships, including the 54 foot replica Viking knarr which sailed from Greenland to L’Anse aux Meadows in 1998 with a crew of only nine men. There is also a chieftain's hall, church, and a workshop, with costumed interpreters who bring the site to life. All buildings, which consist of wood paneled walls and earthen floors, have been created to convey the look and feel of the Viking Era. 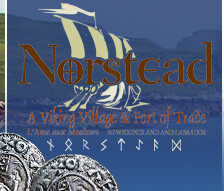 Norstead, which won the provincial Attractions Canada award for “Best New Attraction”, was the centerpiece of a series of events held in 2000 to mark the 1,000th anniversary of the Vikings' arrival in the New World. Those events generated widespread media coverage and helped the site attract 28,000 visitors in its first season of operation. The aim of the site is to ensure that visitors have the opportunity to gain a broader understanding of Norse life, while having fun through an enriched travel experience.